Newly minted Gen-X powerboaters talk about their decision-making process in becoming boat owners. The couple decided that this 23-footer offered them the right combination of fishing and family time onboard. My daughter Katie Ligibel Grey grew up washing worms on the deck of my rusted-out pontoon boat in the middle of Kansas. Her husband, Eric Grey, spent many an hour fishing off the banks of Loch Raven Reservoir or put-putting around with his dad in a beat up old skiff in Baltimore County. Little wonder that when the two moved to Annapolis nine years ago the prospect of some sort of watercraft was in their future. “It was always a question of when… not if,” says Eric. True to his roots as a man who makes his living on K Street in Washington, DC, by utilizing his powers of persuasion, Eric marshalled just the right amount of cajoling and hard facts to win his wife over. Happy new boat owners aboard their 234 Sea Hunt Ultra. 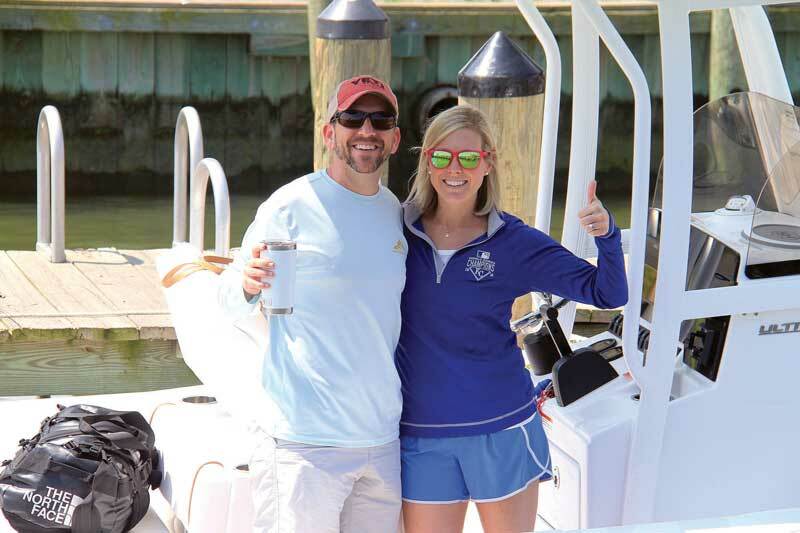 The trick was to find a family-friendly boat that satisfied Eric’s desire for a comfortable fishing craft and Katie’s prerequisite for ample seating, safety, and shade. The hunt started at last year’s U.S. Powerboat Show in Annapolis. The couple parked their kids with their all-too-willing grandparents and spent a full day exploring every option on display at the show. 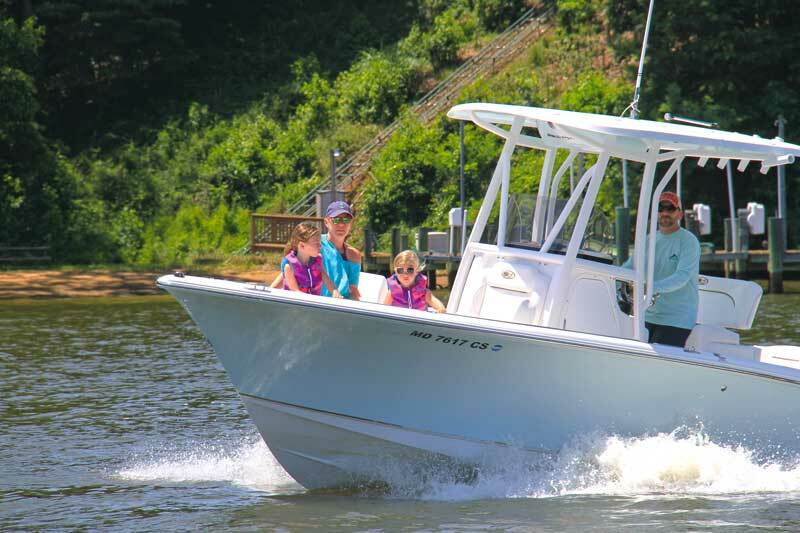 With more than two dozen center-console boats on site, the task was a daunting one. Pretty soon, Eric zeroed in on the Sea Hunt line. He considered Scouts, Robalos, Edgewaters, Prolines, and Grady Whites. Eric’s quest took him to the Baltimore Boat Show last winter as well as the Miami Boat Show in the spring. Eric isn’t the only fisherman in this story. AJ snagged the young couple “hook line and sinker.” Now he just had to reel them in. The two would-be boaters weighed the pros and cons of new versus used. Emmy and Caroline enjoy their new boat. The 234 Sea Hunt Ultra model, complete with a full Navionics package and a 200-hp Yamaha motor, cost around $65,000. The couple picked up the boat just before Memorial Day. After a brief orientation, they set out across the Bay on a flat day to bring her “home” to the South River’s Oak Grove Marina. 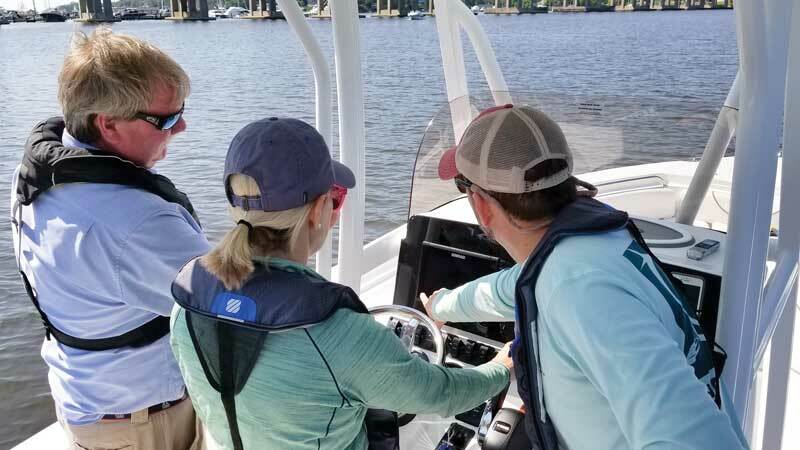 Knowing that small boat handling was a skill best honed over time and with proper instruction, the two had made arrangements with Annapolis Powerboat School’s John Cosby to take a full-day’s lesson in boat handling on their own boat. The six-hour course cost $550. “It was money and time well spent,” says Eric. 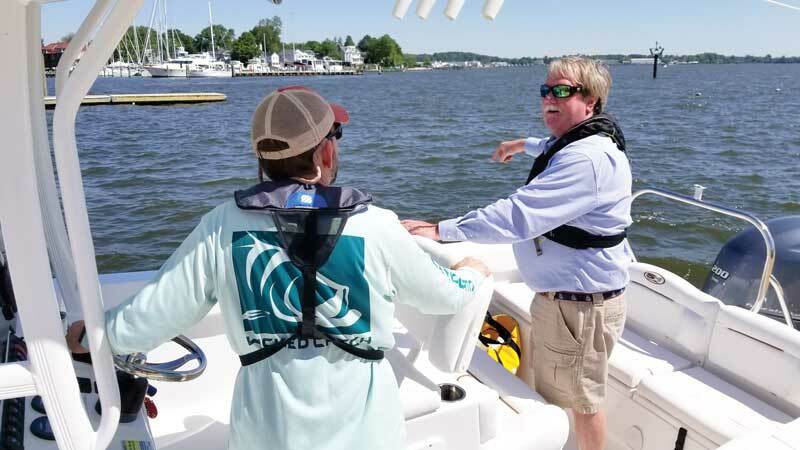 John Cosby of Annapolis Powerboat School gives Eric boat handling tips. 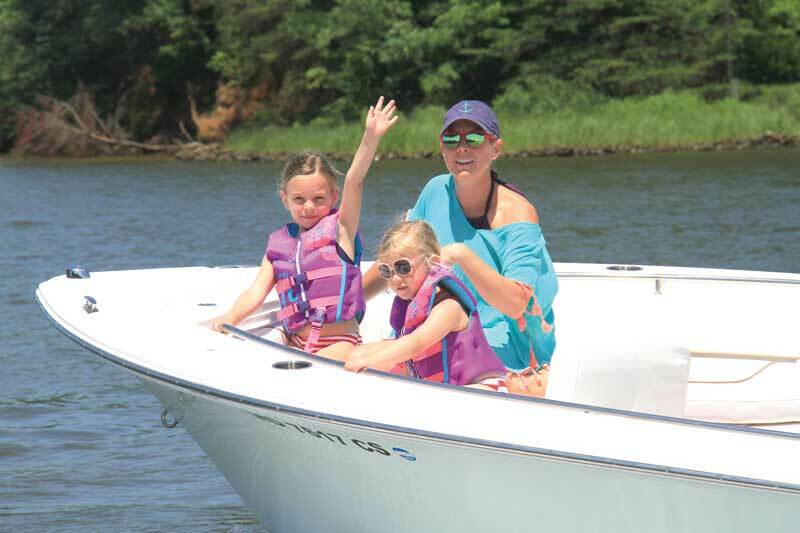 Cosby, who is the managing director of the school, is one of three powerboat instructors at Annapolis Powerboat School (a division of Annapolis Sailing School). John met the couple at Oak Grove a week after their initial trip across the Bay. The first thing he taught them was how to use bow lines and reverse thrust to handle the boat in close quarters. Then, he demonstrated how much easier it would be to back out of the alley into the river than to turn the boat around in the narrow turnaround. With a wink, he told Katie to “back her out.” You should have seen the look on Eric’s face. Here was his wife backing his new $65,000 boat up in the same narrow space that caused him so much consternation just a few short days previously. She handled the challenge like a veteran. Case in point: John had Eric and Katie make no fewer than 10 approaches to the dock under his watchful eye. Cosby helps Katie with navigation. The day’s instruction included some chalk-talk at Annapolis Sailing School’s headquarters just off Back Creek where John went over the rudiments of chart reading, buoy nomenclature, and nautical knots with a dose of celestial navigation thrown in for good measure. Then it was off for a trip down and mistake-free turnaround in a crowded Ego Alley; all culminated by a slick approach to Harris Creek’s Cantler’s Seafood Restaurant with a little anchoring practice immediately after lunch. Eric and Katie’s new Sea Hunt is now part of the family. Everyone is chiming in with name suggestions. Current front runner is: GreyT Catch. Whatever she is called, I doubt seriously if either of Eric and Katie’s girls will be washing worms on her deck. So much for Kate’s nautical heritage.